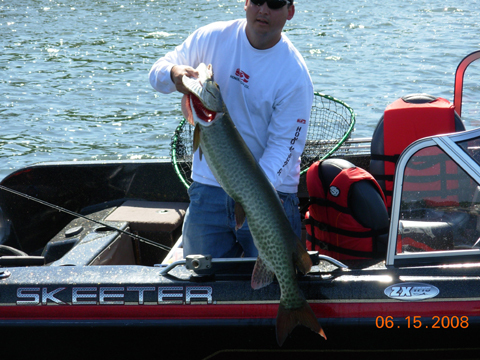 Just asking if anyone stuck a good muskie on the Wisconsin or Minnesota openers? Would like to see a picture of a good 2008 season ski'. No luck here yet, just went to toss some spinners and small bucktails from shore at some metro lakes to try my luck, but didn't have much time to spend in one area. 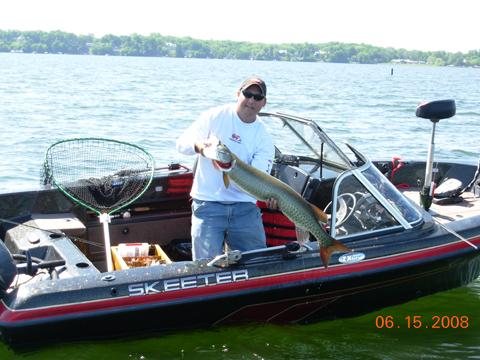 Just keep the rod in the car and if you happen to be in the neighborhood of a lake w/ muskies, just stop by for a few, its cheaper than the pubs and a safer place to get into a fight. Funny you should ask. Last week in our fishing league we were pulling spinners in the Bay for Walleyes and hooked into 2 of them going about 40 plus inches. Was fun on 6# test. "its cheaper than the pubs and a safer place to get into a fight. " Now that's funny...I don't care who you are..that's funny! My Uncle, Cousin and myself went out on Bald Eagle Lake that Sautruday, just for the evening. Only had about 4 hours of fish time under our belts and had one strike on a Bucher Tail Top Raider. 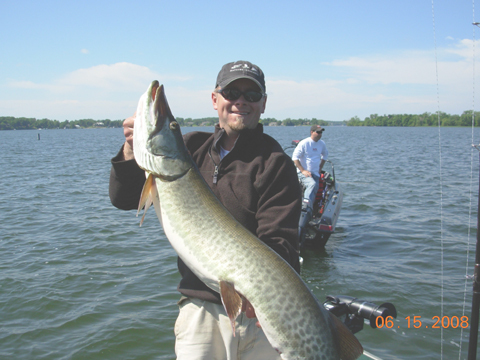 An easy 40+ inch fish, but my cousin wasn't paying attention and missed it. But if I could get one on every four hours, I'd be pretty darn happy!! I wanna get one of those joe bucher topraiders but they are so expensive. BD wanted me to post these pics... I also added them to the database... Thanks BD!